Thursday’s strong push higher for silver resulted in the industrial commodity breaking both the 9 and 14 day moving averages, but failing to breach the 40 day moving average. Friday’s price action also failed to break this technical level as silver traded in a very narrow range sandwiched between the three short term moving averages. 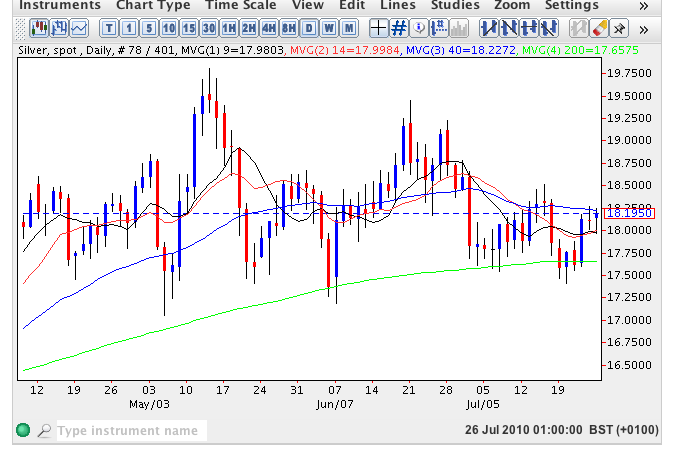 The 200 day moving average continues to provide strong support for a potential to the upside and with further extensive dollar weakness expected, as evidenced on the usd index chart, then one of the main beneficiaries is likely to be commodities and as such we should expect to see silver push higher and perhaps breakout of its recent sideways price action. Our initial target remains $19.00 per ounce and beyond and once clear of the present deep congestion should provide a much needed platform for a bullish trend to develop.